Sometimes you find yourself in the mood to make a grand pastry or dessert, even if it takes a lot of work. It's so beautiful and so delicious that you don't mind organizing your time and washing a lot of dishes and pans. The payoff is one you can share with family and friends and it's so satisfying that the challenge is welcome. Then there are times when you just want a quick treat, when you simply want something you can assemble and bake in no time at all without the fuss of unusual ingredient lists or belabored instructions. You still want that buzz of deliciousness but don't have a lot of time or the focus to spend in the kitchen. If that describes your inclination at the moment and it's cookies you have in mind and chocolate you fancy, this is your recipe. 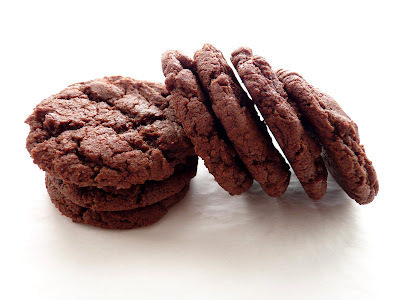 It comes from rightfully acclaimed cookie expert Alice Medrich, so let there be no doubt about it. 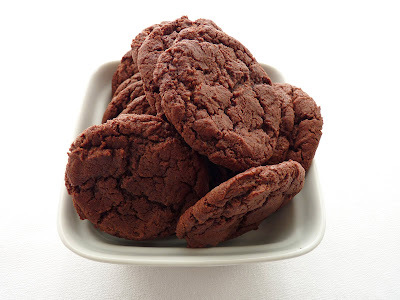 These cookies have a deep cocoa richness without being too rich. 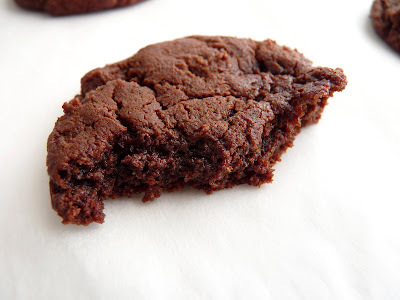 They have a fudgy texture and they're balanced in terms of sweetness and great flavor. The ingredients are basic and handy and the method couldn't be easier. You start with melting butter in a saucepan and the rest of the ingredients get mixed right into the same pan. The cookie dough is beautifully easy to work with and the cookies are baked in 10 minutes flat. This is for chocolate fans. If you have a desire for a great chocolate sensation and can spare a few minutes, crank up the oven. This is the real deal. It's certainly a recipe you'll want to add to your cookie repertoire for just the right moment. - Medrich advises that bleached all-purpose flour (rather than unbleached) makes more tender cookies. - You can use natural or Dutch-process cocoa powder. I used natural. - Though the dusting of powdered sugar would add more drama, I omitted that step and thought they were the right amount of sweetness. - I'd use a heaping 1/8 teaspoon of salt. 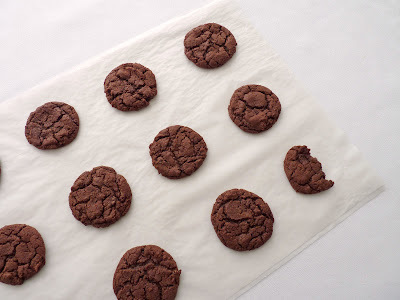 - When baked for 10 minutes, the cookies are fudgy and soft in the center. Add another minute or two and you'll get a cookie that is chewier. - When you test for doneness, the cookies are going to feel very soft to the touch. They firm up as they cool. - The recipe says it makes about 32 cookies. I made mine a tad bigger and got 25. - To gild the lily, I can imagine adding a pinch of spice or small bits of chopped nuts or an extract. Preheat oven to 350 degrees. Line two baking sheets with parchment or silpats. Cut butter into small pieces and melt in a medium saucepan over medium heat. When the butter begins to sizzle, remove from heat and stir in the cocoa powder. Blend until smooth. Add the sugars and blend. The mixture will be sandy. Mix in the yogurt and vanilla. Add flour and stir just until the whole mixture is moistened and there are no streaks of flour. Drop rounded tablespoons onto prepared baking sheets, 1 1/2" apart. Use a fine strainer to dust powdered sugar on the tops. Bake for 9 to 11 minutes or until the tops look dry and cracked but they are still soft to the touch, rotating sheets from top to bottom and front to back about halfway through baking. Remove the pans and cool on a wire rack until firm. Your last picture is GREAT! I hope you were the one to take the bite. Victoria, yes that was my bite - for photo purposes, of course! I don't normally like fudgy chocolate things because they're usually way too sweet and too rich. But these cookies are terrific! Hi! I made these yesterday and I had to report back! They are so easy and amazingly delicious. They stayed chewy all day (they only lasted a day!). I used sour cream as I didn't have any yogurt, and didn't add vanilla because I was out. They were still fabulous!Can't wait to make again! leena, aren't they wonderful? So easy and delicious they tend to disappear rather quickly, to say the least! Definitely one to place in your OMG Cookies File. My 10 year orld daughter and I just made 2 doubled batches for teacher gifts and we are so happy with the results! we used 2 t espresso powder, greek yogurt and natural ghiradelli cocoa in one batch and plain yogurt, vahlrona cocoa and no espresso in the other. We prefer the former but both are so tasty and easy to make. We've already discussed adding peppermint extract and crushed candy canes for the holidays. Your blog is one of my favorites! Thank you! daphne, oh my gosh, what a sweet note. I'll have to try your modifications in the future. As I was tasting, I also thought these would make great chocolate mint cookies so I'm glad you mention that, too. I made these last night and they were not only really tasty, but SO easy! I added a pinch of clove, which made them a bit more interesting, but otherwise followed the recipe exactly. I thought these would be really great with either coffee or caramel ice cream! And if I can, I'd like to ask a question. I often find my cocoa to be lumpy and worry about measuring it with so many lumps. Do you sift your cocoa before measuring? I'm reluctant to do this because some cocoa stays behind in the sifter which can then get into flour the next time I use it. Is there a significant difference in volume if ones cocoa is lumpy? Hello, saturday mike! These cookies are definitely good candidates for spice and they would also make excellent candidates for ice cream sandwiches. Your two suggestions for ice cream would be my favorites, too. Swoon. Questions are always welcome! I use a fork to stir and break up lumps of cocoa before measuring it. This also helps to aerate it since it easily gets compacted when sitting on the shelf. I use the dip and sweep method after I've done this. For cakes, after measuring I sift with other dry ingredients. Then I wash my sifter and set on top of my gas stove to thoroughly dry it out. I don't know why I never thought of using a fork! D'oh!! Haha! I know, right? Not everything in baking is overly complex! Wonderful looking and I'm sure they will taste as good as they look! I just made these from the recipe in Alice Medrich's chocolate book and for some reason mine didn't spread at all. From the pictures of other bloggers who've made them, it looks like they are definitely supposed to spread. I decided to flatten the cookies with a spatula towards the end of the baking and also flattened the next batch before putting them into the oven. Do you know why they didn't spread? Rella, thanks for stopping by. I've been thinking about your question and I can't really figure out why your cookies didn't spread. I would say, just make sure you measured all the ingredients correctly, drop by a tablespoon and bake at 350. I wish I could be of more help. I hope you enjoyed them nonetheless!